Who am I ? - "Growing up in Brattleboro"
A "spewing" of memories and thoughts put to print (the book will come someday) - You may wish to send this page to your printer or bookmark it for closer reading at your "leisure" or convenience. Hopefully, you relate to some parts of my story and of course, be totally inspired as to who you are! Life can be "deep valley" and "mountain top" experiences, but we can rise above anything IF we will trust Him. Remember, it is in those deep valley experiences that we grow the most! I'll mention some "famous names and people" (you'll see them in living color--Bold Blue) and give you a bit of history about myself, friends, family, and The Town I grew up in. It is my humble opinion that you will enjoy the story! Here's your way out if you are feeling "Not right now please" - Hit your "Back" button or take me to the main site page. If you enjoyed some of the links and history then please sign my Guestbook and don't be telling any "old stories out of school!" I'm glad you stopped by. I was born, as they say, at a very young age, on the farm at my Grandma Martin's house in Winchester, New Hampshire. We moved to Brattleboro, Vermont prior to my turning 6 months old. Whoops, I slipped. That means I'm not a native "Vamonta." Hey, it wasn't my fault. I am a converted Vamonta though and my dad was born in Montgomery Center! And, New Hampshire is the twin state to Vermont. Grandpa and Grandma Martin passed on before I was four, so I have no memories, only photographs in my Genealogical Collection. I was the "baby boy" of a family of seven kids at the time. Becky-Jo would come four years later. (that made five, yes 5 sisters and two brothers). I was known by them as their "little big brother" or "big little brother" in that today I have grown to 6'4" and up to 221 pounds. Can you imagine getting ready for school while three of your sisters prepared themselves? We also had twin brothers, Craig and Curt, stillborn on February 7, 1949. That would have made the genders even (5 girls and 5 boys). Big, but way shy of the Bristol Family! My dad left my Mother and maintained a second family of in upstate New York. If you notice above and here, I used the small "d" for dad. I'm not bitter, but because of what my Mom did for us eight kids that he didn't, I always say that she was a Mom with a capital "M" and he was a dad with a small "d". Do you understand where I'm coming from? We lived on welfare and God bless welfare for those who really need it. For those who don't...get off it, get a job and do something with your life! Well, we moved to 211 Western Avenue in West Brattleboro, across from the Congregational Church. It would be the last house on the right, as you're traveling west, at the corner of what is now the turn to Melrose Terrace. It's still white in color. I grew up in Brattleboro, attending Kindergarten at the old Powers House, First and second grade at Green Street, third and forth at the old Academy School, and fifth and sixth at Green Street again. I attended Junior and Senior High at Brattleboro Union High School and graduated with "The Class of '61." We moved a lot in those days. Well, when that "Little Cop" picture was taken I lived at 93 High Street in the big three story block. I still can remember that ground floor apartment. You would come in off the side porch into the small kitchen. To the right was a small hallway which had the bathroom within it and it continued into the back small bedroom where my Mother slept. To the left of the kitchen was the small living room and it continued into the "larger" front bedroom. Within that bedroom were three full sized beds "wall to wall." This is where the kids all slept. Because of that, we all had the mumps, German measles, chicken pox and you name it together. In the house just East of us lived Guy and Marilyn Rounds. They remember my humble beginnings. Their son, Paul Rounds, related a desire I had back then to me recently. It was I wanted my own bed. Can you imagine why? That reminds me, there was a lady named Maude Rounds. She had a son, named Jerry, who was another mentor I had growing up in Brattleboro who furthered my dream of becoming a cop. I can still remember talking to him when he was one of "Brattleboro's Finest" over on the lower part of Canal Street. We were on welfare in those days - had to be with little or no support from my father. I can remember going down to the Municipal Center to pick up our check from a person called "The Overseer of the Poor." I also remember going to Easter, Thanksgiving, and Christmas dinners at parties put on for those who could not afford a nice meal. As I aforementioned, that's why my Mom was a Mom with a capital "M." She committed herself to the raising of eight surviving kids. Today, given the same situation, too many moms would have given up the responsibility and placed the kids in foster care. We moved a lot in those days. I also lived at 160 Western Avenue, 7 Cottage Street, and 2 Southern Avenue. During that latter time I was a member of a gang. (And, you thought Brattleboro is new to the gang scene!) It was know as The Esteyville Gang. It had a few members like: Larry Bober, Terry Parmenter, Bill "Guy" or "Red" (all one guy) and Jackie Therieau, Donny Gray, Bill and Joey Bedard, Morse (Moose) LeClaire, Gary Graves, Norm and Bobbie Sargent, Bill and Eddie Nelson, Wally "Red" Herrick, "Big Jim" Brown, Rick Brooks, and my older-little-big brother Rick. The Esteyville Gang did a lot of dangerous things around town and pulled off much crime...not. We did take on The Fort Dummer Gang in football and baseball a lot. Their gang was made up of tough guys like Paul Beebe, Tanny Lord, and Ernie Barcomb to name a few. We played Little League Baseball also! Make sure you check out the news clippings from the Reformer. You'll find a couple photographs by Ken Campbell from 1955. We would also show up at The Teen Canteen which was held at the Amory (Gibson-Aiken Center now) and Block Dances (held in the parking lot behind the ole A & P Grocery Store) and played it cool standing around watching everyone else dance. We were just plain "cool." There never will be a "cooler" era than ours. Say, have you noticed that kids today are not "cool?" As they say, they're "Kewl." The gang also had quite a following of Ski Jumpers. We followed the lead and instruction of Eddie Bedard. We jumped a 35 meter hill known to us as The Austine Jump and another hill (around a 40-45 meter) called The Latchis Jump. We also jumped The Harris Hill Jump (well some of us (me) only a couple times) just to say we did it! Speaking of other Winter Sports... we used to ice skate at the Crystal Ice and Fuel Skating Rink down on Frost Street, below Brook Street. We helped Roland Fisher shovel the rink and flood it in the late hours. We use to shake the apple trees over at the hospital for "green" apples while the janitor tried to apprehend us (never did). We had advanced lookouts! We would then go to LeClaire's Store downstairs in the house at the corner of Estey Hill and Chestnut Street and to get some of those little Morton Salt Shakers and then go across the street to the steps of the Esteyville School where we would sit and eat a bunch of those delicious sour apples. Ya ... we were a gang! Certain Gang Members pulled off a caper over on Hospital Hill one winter night when the snow was deep and sticky. The story has it that they saw a B.P.D. cruiser come by and they peppered it with a few snowballs. They then hid in specially designed tunnels of snow while the cops tried to find them (never did). Certain Gang Members use to smoke something other than tobacco. Hold it right there ... it wasn't what you think...it was grape vines. Yes, grape vines. They were hollow and didn't stay lit very long. Like I said...we were cool. What amazes me is that three of those guys became Cops...good Cops. I graduated from Brattleboro Union High School with "The Class of '61!". I took the commercial track...two years of accounting, business economics, business law, two years of typing, a year of vocational mathematics, etc. I was going to become a banker and be where the money was! The Class Prophecy said I was one who would become a policeman. I instead drove a delivery truck for the Custom Laundry in Brattleboro for Gil and Helen Dunnell. I had the out-of-town route. I was dating at that time and the money was good--at a salary of $50.00 a week! Kind of funny as I think back now - for the last five years I've become a Genealogist, desiring to know where we came from. I found that a cousin on my Mother's side, Noah Elijah Jenkins, help to found the Educational Society of the Wesleyan Methodist Connection - which became the Wesleyan Methodist Seminary - which is know today as Houghton College. Also found that three members of my family were the original signers of 22 signers of the Royal Charter of Moore-town, Gloucester Co., New York, on 18 March 1771. The original Charter of Moore-town was by King George the Third of Great Britain, France and Ireland. The name was changed to Bradford on 23 October 1788 and became part of what is now Orange Co., Vermont. The girl I was dating was the best thing that ever happened to me in that she started me going to church. I saw her six days a week and was a little disappointed that I could not see her on Sundays in that she attended church faithfully. I was cool so I said to myself-what harm is it going to do if I go to church. I didn't come from a "churched family" and the life I was leading at that time was not the best. Whoa now, I didn't commit major crime. I was just basically a jerk with some dumb ideas and ideals. I broke up with her before I entered the military, but in January of 1962, through her influence, I accepted Jesus Christ as my personal Saviour. Now don't get worried, no one is going to force you to do anything! But, hear me out... after all this is my story and my Home Page. I'll read yours when you publish it. But, anyway "Thank You, Judy." Here is what I did...we went into the choir room at West Brattleboro Baptist with Pastor A. Alan McKerron. I knew that the life I was leading was not up to God's standard. I confessed that, asked the Lord to forgive me of my sins (we are ALL sinners), to come into my heart and to guide me in the future. I'll tell you I felt good inside! There were no lightning bolts or clashes of thunder, but I was changed and so was my direction in life and how I looked at it. I joined the U.S. Army on October 15th, 1962. This was in part because of another dream I thought I had about being a heavy equipment operator. This came from my brother and I operating, without the owner's consent, heavy equipment. This is when they were building Interstate Highway 91. On weekends we use to crank up the bulldozers and big trucks and drive them around. We were "busted" on this one also. Brattleboro's finest once again. (An officer, Sergeant, by the name of Bud Castine. So, it was the Regular Army for me..."RA all the way" which means I committed myself for three years rather than being drafted. I had choices! I went in as a Heavy Equipment Mechanic and became a Heavy Equipment Operator. My specialty was 20 ton Truck Mounted Crane Operator. I took basic in Fort Dix, NJ , "Home of the Ultimate Weapon" - (For you civilians, that's "The Foot Soldier") in the Second Training Division. I remember my Barracks Sergeant. His name was Staff Sergeant "Moses" Green. He use to say "You have a problem? Go tell it on the mountain." I also remember Dave Hinder and Ernie Barcomb being in the Army back then. They were in a different training regiment and I saw them at a distance one day. AIT was at Fort Knox, KY with the 538th Engineers. I was later transferred to the 54th Ordnance there. Then came the levy for overseas transfer. In February 1964, I was transferred to the 5th Maintenance Battalion within the 7th Army, at the at the Husterhoeh Kaserne in Pirmasens, Germany. The shoulder patch was unique. It was called "The Seven Steps to Hell." We thought it was real tough fighting in the "Cold War," but it was nothing compared to those who served on the front lines. Well, any ways the patch had seven steps going up from the left and right to the top seventh step. I guess it meant that we were suppose to shoot for the "top step." As Zig Ziglar says, "See you at the top." In Deutschland they didn't use my MOS (Crane Operator) so a buddy, Bob Marti, from Waterbury, CT, got me a position as Clerk Typist at Battalion Headquarters. I worked my way up to Chief Clerk of Courts and Boards. I maintained a Top Security Clearance within this position and the remainder of my military career. Sounds important doesn't it? Basically, I was in charge of drawing up specifications as to Article 15 from the UCMJ (that's the Military Justice Bible), Court Martial, and all separations from the military (good or bad). I worked directly under the Battalion Commander Samuel D. Whitfield, a tall, black, shaved-headed, swagger stick carrying Captain. I loved that guy and he taught me a lot of skills that I still use today and laid a foundation to all that I am today and have humbly achieved. All battalion discipline, court martial, and separations came through me. 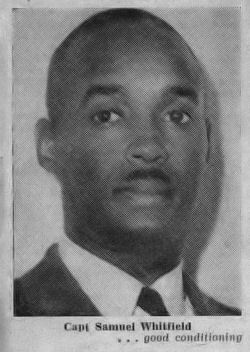 Captain Whitfield was written up in the Stars and Stripes & The Overseas Weekly newspapers as the "toughest" Battalion Commander in all of the USAREUR and he was. But, he was both respected as a Leader and a Person, something a lot of "Bosses" are not today. Sergeant Marion F. Tye, was our First Sergeant and he was excellent also. Guys in administrative positions were know as "pencil pushers." Somehow, we were less of men, but you know what...I blew the doors of those kind of thinkers. I would always max out in physical performance. Neat, in that if you saw me when I went into the service I was 6'1" and weighed 151 pounds. I'm talking "skinny," the kind of guy that had sand kicked in his face on the beach. Well, while in Germany, a couple friends, namely Alden Sheppard and Phil Dipzinski, and I worked out at the post gym on a regular basis. When I returned home I was 6'4", had a 32 inch waist, and weighed 196 pounds. Kind of a late bloomer? Captain Whitfield also re-instilled that dream in me. You remember, the one I had way back at the beginning of this page, when I was five years old...of being a Cop. Captain Whitfield became a Major later on. I felt the Lord calling me in to the ministry, the ministry of Law Enforcement that is. It's not just a "job" you know. Before I came stateside I sent for information on the Brattleboro Police Department and the Vermont State Police through the State Employment Agency. Mr. Ed Milkey was a great help in helping me put my dream together as I transitioned from the military. He was an old neighbor of mine when I lived on Southern Avenue in Brattleboro. Mr. Milkey is "Ginni's Dad. In October of 1965, I was honorably discharged from the military having obtained the high rank of Specialist 4th Class (E-4), having completed my RA commitment. Of course they promised me Sergeant and a bonus if I would re-enlist for for another 6 years. Actually, I was released 30 days early from overseas, as was the custom for those returning stateside. When I arrived in Fort Dix the military figured out what my position had been overseas and put me to work assisting everyone else in their early release from the service. Somehow I knew inside that I was going to be extended. You'll remember, this was the time of the big build-up for Vietnam. I knew I would be going and I would have desired to if it had happened. Two days before my ETS (Elapsed Time of Service) I got my DD214 and was discharged. No guard meetings once a month or "summer camp," because remember I was "RA all the way!" Three years later my full Honorable Discharge papers came through. And, if there are any Vietnam Vets out there...you served your country in spite of what a "squeaky minority" felt. We're proud of you and by the way... "Welcome Home!" I have been to The Wall in Washington several times in real life and on the internet. My brother, Rick, recently told me that he went to see the "Mobile Wall" and said it was real emotional. You may wish to visit The Wall . (Also visit my Vermont Vietnam Veterans Wall as well as a Special Dedication to Veterans with a lot of hyperlinks to anything from The Revolutionary War up through and to The Gulf War. You will also find some special "support" and "MIA/POW" links there for you! Brattleboro Police Department hired me immediately after my discharge in October. I had planned to take my first 30 days from the military off and just lay around doing nothing, but...Chief Reggie Belville hired me right off on along with a guy named Truman "Butch" Yeaw, as a Clerk Dispatcher and Special. Sherwood Lake, Sr. had joined just prior to me. My application for the VSP had been submitted, but I hadn't heard anything. While my primary responsibilities were dispatching, I filled in on the street for Regular Patrolman who were on days off, sick, or vacation. There was no training, I received my badge, an old 38 caliber fixed sighted S&W wheel gun and a half of a uniform. The rest came from Michelman's Store on Main Street (a local clothier). Hey does anyone remember a Dispatcher by the name of "Iggie"Iganowski or Top Cops like Bob Pollica, Bill Wheelock, Frank Eakins, Bud Castine, Grady Vineau, Gib Carey, Leo Paul LeClaire, Marcel LeClaire or Jerry Rounds? While on B.P.D. I fell hopelessly in love. On Friday nights I would earn overtime by putting out parking tickets along Main Street on shopper's cars. I promptly took notice of a very attractive redhead standing every Friday night, around 2100 hours, in front of the old W.T. Grants Store. She was there to pick her mother up. I knew her parents from church and recognized her from Driver's Ed class. So, being the tough cop I was, I would make conversation by threatening her with a parking ticket on her car. This redhead would challenge my authority by hiding her car and telling me, me a really sharp cop, that I couldn't find her car to put a ticket on it. One really dark night I had finished my assignment on Main and was walking back to the Station. By the old A&P Store I saw her getting ready to pull out onto Main from their parking lot. I had to impress her so I stepped out onto Main Street (in my dark blue uniform with no flash light) and put my hand into the air to stop traffic so that she could pull out from this side street. Need I say any more? Well, the tires were squealing on that first rapidly approaching vehicle. The lady in that car was amazingly able to avoid running me over as this redhead pulled out by me. Boy, was she impressed and the lady in the other car was also. It was my Mother-In-Law's (to be) boss from W.T. Grants. Six months later I left B.P.D. in that the Vermont State Police had accepted my application and hired me. I received a letter from Commissioner E.A. Alexander, one of the original Vermont Highway Patrolmen before the start of the the VSP in 1947. The Vermont State Police hired me on March 28th, 1966, and I was off to the Capitol City of Montpelier for an eight week basic training. In those days there wasn't a Police Academy. The VSP trained their own and made positions available for other departments to send personnel. My Academy was the Brown Derby Motel and Restaurant on Route 12 south of town. For eight weeks, our main trainers were Sgt. Foster "Buckey" Corliss, Cpl. "Easy Ed" Prescott, and Cpl. Arthur "Bud" Yeaw. Bud had also been one of Brattleboro's Finest years prior. We roomed two to a motel room (no TV), had classes and ate at the restaurant, and did physical training at the Armory in Montpelier. I roomed with a guy named J. Bruce McDonald. During my Police Academy I started dating this redhead with a "pony tail" and I might add, it was with the the blessing and help of her Father and Mother (Dorr and Mary Hudson). You see, I called to ask her out and she wasn't home. Her Dad knew where she was and told me to be sure to call back later. I did and she accepted! Loretta Shirley Hudson! Once again, I impressed her. I took her to the A&W Root Beer Stand on Putney Road and parked in the back row where all the "cool" guys did. She was not impressed. She had worked there during her summer vacations from college and had had her fill of the "cool guys" in the back row. She and Cindy (Nesbitt) Falvey use to send the "new car hops" out to the back row. They knew that we were not so cool and "poor tippers." You know what...she remembered me as being that way. When I took her home that evening she asked me if I was a Christian and I told her I was. She told me she didn't want to date me again. I went home and told my Mother that I had just met the girl that I going to marry! She was quiet, yet cool...she had a 1961 Chevrolet Impala, 4 door Hard Top Convertible, white over red, 2 speed automatic (slush box) transmission with a 283 V-8. Here's how cool she was...One day we were heading down the road in my 1964 Chevrolet Impala, 2 door Coupe, maroon, with its 327 High Performance engine. I reached back to pursue a habit that the military had taught me. I grabbed a can of beer. Now, I never touched any drug prior to going into the Army. They marched us down to the Beer Hall and fed us beer with 3.2% alcohol content. I was a Christian and made the wrong choice then. Well, I had become a real good drinker by the time I came out of the service. Real good. When I got out I was in the first stages of alcoholism...blackout. I would come back to the barracks many a Friday or Saturday night and never know how I got there, how many "zombies" or that "good" Germany beer I had consumed. I even remember waking up the following Sunday afternoon from a Saturday night out, wet in my bed. Those were "glorious days" in my life back then. So anyways, I popped that tab and she said..."what's that." I explained to her what it was and she said..."I don't date guys who drink." Whoa...decision time men. It was either her or my beer. I pulled over at the first pull off I could find. I reached across her and popped the door open and said...hit the road! Not...I got out after securing the rest of my six pack. I went to the trash barrel, popped all the tabs, pouring out the contents and threw the cans in. I have never touched a drop since and the Lord took away the desire to. I went from near alcoholic to drug free in a moment. That was 31 years ago. By the way, I started smoking when I was twelve and fortunately gave it up when I was twelve. Amen? We started dating on April 23rd, 1966, got engaged on September 14th, 1966, and married on February 14th, 1967. How's that for getting the job done? Let me go back a bit at this point and mention that we purchased the engagement ring at Simon's Jewelers on Main Street in downtown Brattleboro. We also purchased our wedding bands there. Jim Lantz managed the store and was an excellent salesman and jeweler! We had to have the engagement ring cut down a size and he did it there in the shop flawlessly. Amazing huh? Today you have to send something out of state to get that kind of work done. I know a guy in town that still sends work to him in that he can't find anyone that does that kind of craftsmanship here. Jim, wherever you are we miss you! By the way, I still have my high school graduation watch that my Mother purchased there and had the back engraved. I also have the ring boxes with the Simon's Jewelers name on them. Did you notice the day that we were married on? She picked that out and we had an Tuesday evening ceremony. Her picking the 14th of February certainly had nothing to do with guys who forget their wedding anniversaries. It was a candlelight ceremony and we had a red and white color theme. She showed up twenty minutes late, as the organist played on and on and on. My brother-in-law, Rod Winchester, and I were down stairs testing the cookies. Pastor A. Alan McKerran performed the Christian ceremony. We headed out from the reception that night for Maine with no reservations. We drove for hours and found that "there was no room in the inn" for us either. We had supper at the bowling alley in Portsmouth, NH and finally found a room (Room Number "14") at Howard Johnson's. We brought skis with us and made it to Bridgeton, ME were we skied for one day and stayed in our room the rest of the week. It was sub zero weather that whole week in Maine. In November of 1967, on Thanksgiving, my dad died of cancer at the age of 57.. He suffered for a year prior and went from a 6'1 man of 225 pounds down to a less than 100 pounds. I went out to see him twice prior to his death. The second time I witnessed to him. Two weeks before he died he accepted Christ as his Personal Saviour having had a lot of time to think about the life he had led. We don't always get that kind of time. In January of 1979, my Brother-In-Law, Paul Colburn died, leaving a wife and four kids. In February of 1980, my wife's Dad, Dorr Hudson, died. In February of 1981, my closest sister, Becky Jo Martin, at the very young age of 33, had a massive cerebral hemorrhage. She went in a comma and died four days later. Rescue, Inc. did an excellent job with what they could do in a situation like this. Becky was a single parent and left a 9 year old daughter Kari- Jo. Loretta and I took guardianship of her. I administrated Becky's estate. I left Becky's daughter with my Mom in that the three of them had lived together. We began to wonder every January or February as to who was going to die in the family. Well, the Lord gave us a couple years to mend and grow. On June 2, 1983, my Mother died from injuries sustained in a double fatal car collision on Route 116, in Amherst, MA. My oldest sister, Sharon, was driving that day, Kari-Jo, was riding in the backseat, when a guy ran a red light in front of them. That day we all went to the hospital in Northampton. As we each filed in to see her, and she, like a true Mother, wanted to make sure we were all okay. That night she went in a coma and Four days later the Lord took her home. We began raising Becky's daughter, Kari-Jo, now age 11. After sixteen years of marriage this was just a little different for us, having had no children of our own. We had raised plenty of cats. I administered my Mother's Estate. In April of 1994, Loretta's Mother, Mary Hudson, passed on to be with the Lord. We were all at her bedside. If was difficult, but an honor. She didn't pass on until everyone had arrived. On February 28, 1995, my niece and her husband were killed in a double fatal collision on Route 12 in New Hampshire. Debbie and Mike Decoteaux left three children, Mike, Becky and Donnie, the latter two were minors. I helped establish the estate. Debbie was just 40 years old and Mike, 42. On October 28, 1995, my Brother-In-Law, Ed O'Connor passed on. Ed was married to my sister Myrna. On December 13, 1995, my Sister-In-Law, Joan Martin, passed on. She was the Debbie's Mother. Joan was just 60 years old. On December 23, two days before Christmas, my oldest Sister, Sharon Root, passed on to be with the Lord. She died of cancer at BMH. We got to be bedside with her also. I remember sharing with her that if it was the Lord's will she would make it through and if it wasn't, we would see each other again because of our mutual faith in Christ. She died five minutes later. On October 10, 1998, my Brother, Donald, died of cancer at home in Orleans. His wife was Joan, above, who died on December 10th, 1995. 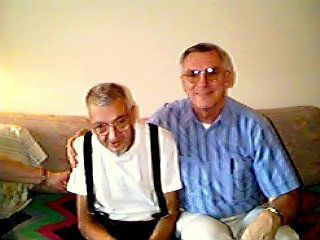 Brother, as we called him, was a Dad (with a capital "D," in the early part of my life, up until I went into the service. He taught my brother Rick and I how to fish and shoot guns. I'll never forget the "car" he built for us when we lived in West B! (Picture to follow soon). He was very talented - an artist with ink, water and oil painting; an electronics technician, and a master furniture finish carpenter! I'm so glad that I had a wonderful weekend with him a week before he passed on! Lana, Myrna, and Anita (remaining sisters) all went up that weekend. I knew he was prepared and wanted to go home to be with the Lord and Joan. Brother had gotten saved after Joan died. I knew this in that I had called him concern as to his position with the Lord. I had witnessed to him over the years. Praise the Lord he told me of his asking the Lord into his heart. Special thanks to my cousin Arland Francis who help Brother out so much those end days and made sure that he was ready to go into eternity. On December 17, 2000, Aunt Ruth Evelyn (Holmes) Harris passed on. She was just 84 years young. She was the last of my Mother's family left and looked so much like my Mother! One of her grandchildren, Laura Harris wrote a beautiful poem. It is entitled "Never Again" (Click on the Title to read) She always loved that meat board I made for her back in elementary school. I loved her for her love for me and others and her baked beans. Though future birthdays will bring back the loss of a loved one, I consider it "An Honor" for her to have passed away on my birthday. On August 30, 2003, my sister, Anita, died of cancer at home in Hinsdale, NH. Anita was the "Jokester" of the family. My brother, Rick, and I use to go to Wilmington, where she lived at the time for summer visits! We worked hard for her one day to be rewarded with all the "Hershey's Chocolate Candy Bar" we could eat! (that first bite was bitter-sweet - it was cooking chocolate). Seems she was always losing forks and other items in the pies she baked also. Anita was just 69 years old at her passing. Well, my "Long Story" is not completed yet. I have said all this to say this--You may be out there and you are hurting. Life is tough, but you can make it. It is too short to hate and fight with those who are the closest to you. It doesn't matter what circumstances you are in. You can overcome, but you cannot do it by yourself. Don't be afraid to ask for help from someone you can trust and can share with. There will be differences, but make amends and reconcile as soon as possible. God forbid that the person you had the difference with died and you had not made your amends... you would have to live with that for the rest of your life. I know people who are doing this...it's very sad. It is my faith in Jesus Christ that has sustained me through so much hurt in my life. For you that know me and know my usual positive attitude, I want you to know that it is Him who keeps my chin up and picks me up when I fall and fail Him. If you are out there in "Cyber land" and you are hurting, you don't have to be. God wants you to know who he is and has a "Special Plan" for YOU and your life. You'll be glad you did. I'm not asking for anything or pushing you to do anything. I'm just sharing a real life with you. We may not ever meet "face-to-face," but we could be guaranteed to in Heaven and there is only one way to get there!